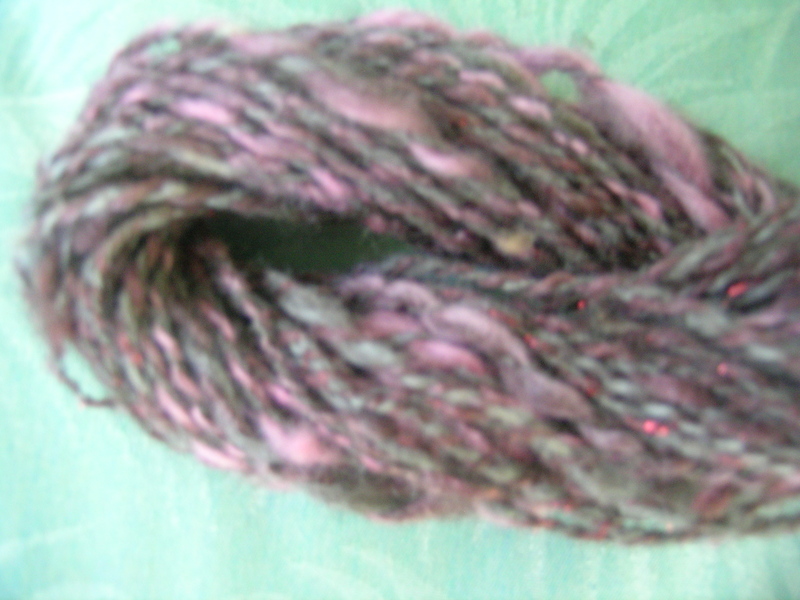 I am not really sure if this can be called a skein or not. 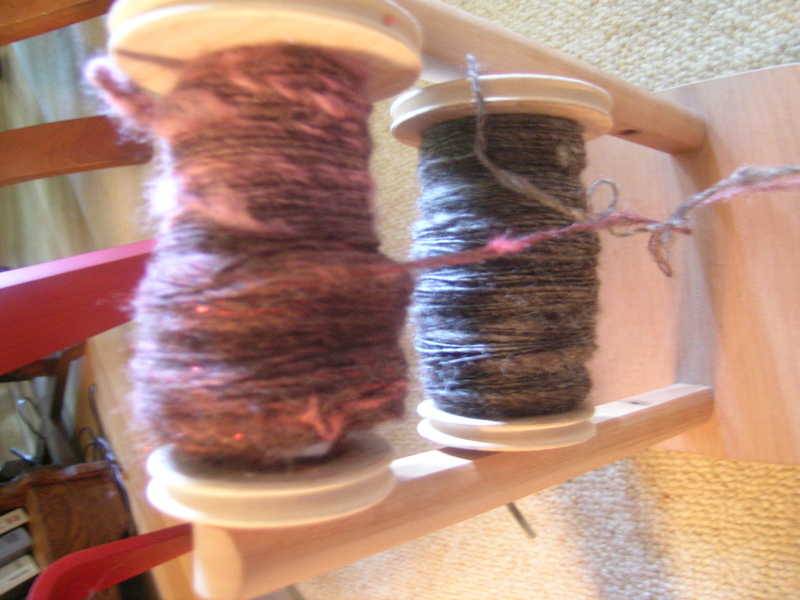 I spun the burgundy color first, then random natural dark wools. I got them all free, so not clear what type of wool anything is. By the time I got to the natural dark brown, I was much better. I would not use the term good yet, but I did not split the end of the spun ply as much, and it was not as bulky as the first set. Consequently, I have much more yardage of the brown. I did ply them together, and seemed to get the hang of it. I do not have a knitty-knotty so I used my swift to wind it together. I think that I have about 60 yards. What would that be enough for? Hey! That brown single looks GREAT! I like the sparklies. I think you should hang on to it for now. I KNOW you want to knit it, but wait. It will be cool as a trim to the cuffs of mittens made with “later” yarn, or the brim of a hat. Or you could make me an iphone cozy. Yeah, I think that i will save it. I will hang it in my new knitting room when I get that together. 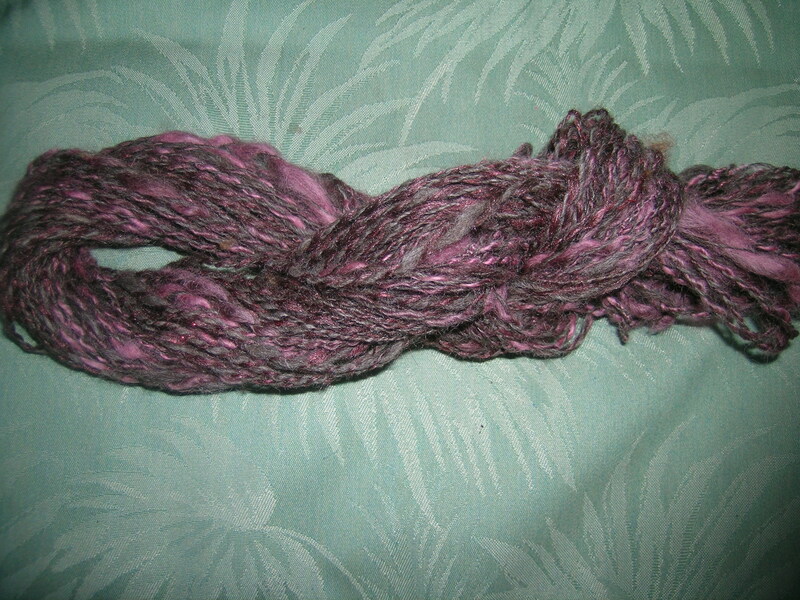 Congrats on your first skein–I am impressed. I think you need to hang on to it as a reminder of where you were and how far you have come as time goes on.